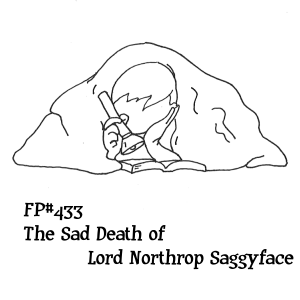 FP433 – The Sad Death of Lord Northrop Saggyface | Skinner Co. Welcome to Flash Pulp, episode four hundred and thirty-three. The first time Titus Bitok noticed something was amiss, he was conducting a sweeping battle across his room’s rug and into the cliff faces of his rumpled bed. The empire’s forces had been hiding beneath the comforter all along, and the small band of rebels in their shag-floored fortress had little hope of surviving unless Johnny Strongarm could use his bit of twine to repel down the sheets and warn his friends. That’s when Lord Northrop Saggyface entered the scene. The dog, taller than the boy despite the fact that both were the same age of five, brought a quick end to the wall of hard-backed novels that formed the resistance force’s compound’s western defenses, then the beast was into the crawlspace and out of sight. Seconds later Ayah Bitok, Titus’ mother, burst through the door. Her hair was free of the scarf she’d left the house in, and her mouth had taken up the tight line that usually meant Dad had said something mean that she wanted to pretend hadn’t happened. In truth he was a little annoyed at having to repair his base, but the boy commander shrugged it off. He owed Lord Saggyface a few favours, and he could see no gain in getting the mutt in trouble. He did not notice that she was sweating as she departed – nor that she took the unusual step of closing the door behind her. That Saturday night, Titus slipped his babysitter’s dozing gaze and crept into his bedroom. Generally the race to see if she’d fall asleep before thinking to put him to bed resulted in his treating himself to a movie starring aliens, people with laser cannons, or car chases – all three if he was especially lucky – but this evening he’d set himself a special goal. Though his mother had done away with most of the traces of his father about the house, she’d set aside a stack of ancient horror comics, noting that they were actually intended to be the child’s by way of grandfather. “A much better man, and it is only too bad you did not have the chance to meet him before his passing. He was always eager to hold you,” she’d said. Still, though she’d fanned the ghoulish covers of his inheritance, she’d set his estate high on her closet’s shelf, deeming them too terrifying for a youth his age. This had been no obstacle at all once Cynthia had arrived. Dragging her to the park, to the store, to the ducks, and then home again, he knew he’d exhaust the chain-smoking woman who lived in the other half of their duplex. He’d been patient through a half-dozen dragging snores, then, with a cat’s stealth, he’d shifted a chair and retrieved his prizes. It was just after midnight of that evening that Lord Saggyface stepped from the cubby and stood, the bulk of his broad gray fluff projecting into the room, while his head joined Titus beneath the glow-lit sheet that hid the undertaking from any who might stumble through the door. Titus spent some fifteen minutes softly reading aloud to the dog’s bobbing tongue, then a noise the reading boy could not make out drew Northrop’s attention to the window. With childhood reflexes, the light was extinguished and the the exterior darkness flooded the room. Saggyface’s gentle panting became the only sound, then came the grind of a shifting pane, and a grunt from beyond. The beast opened his throat and took to roaring, and Titus began to shout for him to be quiet while attempting to collect his stolen goods. Cynthia, roused from her nap, burst through the entry with ragged lungs, inundating the room with light and kicking off a week’s grounding. Titus could not help but notice the tension creeping into the quiet moments of the next seven days. When Cynthia had come around for Sunday tea, the boredom of the afternoon had been broken up by the first fight the boy had ever witnessed between the woman and his mother. They did not speak throughout the march of days, and more than once Titus caught Ayah closing the blinds against the sound of their neighbour coughing and lighting another cigarette out on the sidewalk. A mere fifteen minutes after his Thursday night bedtime, the screen door swung against the outer wall, and the house fell silent. Titus, taut with the boredom of his punishment and the pacing of his mother, had been already been hard-pressed to fall asleep, but now, with the child’s increasing surety that he was alone in his home, his feet began to wiggle. He wandered into the bathroom, Lord Saggyface shuffling along behind him, and no voice raised an objection against the fact that he was out of bed. He wandered into the kitchen, his mouth half-open and ready to deliver his excuse of needing a glass of water, but again no objections came. Through the glass patio door that looked onto over the yellow grass of their back lawn, Titus noticed movement in the shadows. It was his mother, and she was hoisting a shovel. His curiousity suddenly outweighing his caution, Titus slid back the exit. Stepping onto the turf with barefeet, he approached the short trench that had been dug alongside the rear fence. Ayah turned, clearly startled, and the boy wondered briefly if her raised brows might avalanche into anger over his violation of curfew. Instead she seemed to take his measure, then sighed. She dropped a load of muck on her growing pile as she spoke. “Yes,” replied Titus. He hated to rat out his friend, but he also knew he wasn’t the only witness. Somewhere on the street a car door slammed. Neither noticed. A third voice joined the conversation then, and not a welcome one. It’s tone was thick and slurred. “Dad?” asked Titus, but he did not mean it as a question of identity – he knew perfectly well who the man was – he meant it more as an inquiry into why his father was holding a broad-hilted knife. It was the most directly the boy had ever heard his mother speak against her ex-husband. Titus, however, had long grown sick of the old man’s habits. “Dad,” he said, “everytime you come around, someone cries. I cry, mom cries – I’ve even seen the lady next door cry over some of the things you’ve said and done. Though it was an effort to keep his knees from knocking, Titus worked hard to take on his best Johnny Strongarm stance. He needed Dad to believe, because he really wasn’t sure how he could make good on this threat otherwise. His father raised his knife and smiled. “No more tears – come here, boy,” he said. That’s when Lord Northrop Saggyface gave his final charge. He held no form on this occasion, his assault consisted of only howls and barks long reserved for the man who’d too often silenced him with a boot, but it was enough. It was a small back yard – barely ten feet between Cynthia’s privacy fence and that belonging to the Mainas next door – and the shovel’s long handle made it easy to close the distance when their assailant turned to try and catch sight of the beast. Ayah did not stop swinging until Titus had grabbed the dropped knife and tossed it clear of the melee. An hour later, with all safe, it would be up to the police to find it where it fell: Atop Lord Northrop Saggyface’s already decaying corpse.